The citizens of one of our largest cities are being shut out of the decisions that will affect their future. After decades of deindustrialization compounded by state and federal neglect, Detroit has been placed on a crash course that could see it in bankruptcy before year’s end. Yet instead of running away from this challenge, legislators, a former police chief and a former county prosecutor are all competing in an August 6 primary and a November 5 general election to choose a new mayor. The timing couldn’t be better for voters to weigh in on the city’s tough choices and set priorities—and to choose leaders to implement them. There is just one problem: the winner of the election will not have the authority to govern. At a time when Detroiters should be charting the course for a city that still retains immense promise despite severe fiscal challenges, Michigan Governor Rick Snyder has seized power from local elected officials and handed it to a corporate lawyer he has named as the city’s “emergency manager.” In July, Snyder announced plans to steer Detroit into a federal bankruptcy process that could see its services curtailed, public employee pensions cut and assets sold off. 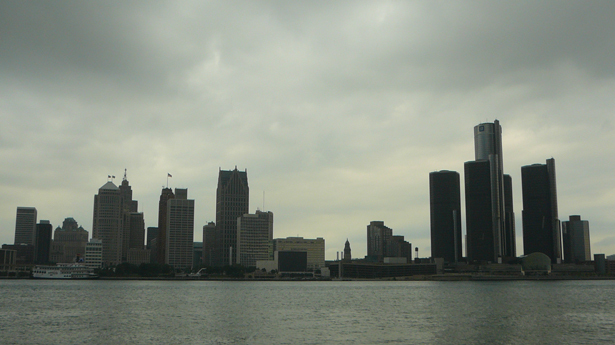 82 to 18 percent in Detroit—to scrap the emergency manager law, which Snyder had been using to take over smaller cities. Yet within weeks, Snyder signed a new version of the law—one that has been championed by the Mackinac Center for Public Policy, a think tank funded by Charles Koch’s foundation with ties to national conservative groups like the American Legislative Exchange Council. This spring, the governor used the law to seize control of Detroit, sparking a public outcry and legal battles. The real cause of the crisis is deindustrialization, which began many decades ago but accelerated dramatically with free-trade deals like NAFTA and the permanent normalization of trade relations with China. From 2000 to 2010, metro Detroit lost 52 percent of its manufacturing jobs. In 1950, factories employed one in ten city residents; now it’s one in fifty. And while auto companies got a massive federal bailout in 2009, that did nothing to stop the shuttering of factories or the offshoring of production. The Big Three automakers are posting headline-grabbing profits, but manufacturing employment in the industry is still down roughly 200,000 jobs from where it was a decade ago. Nearly a dozen major auto plants once operated in Detroit; now there’s just one operating wholly within the city limits. It’s primarily Detroit’s size—and its place in the imagination of a country that won’t forget the Motor City—that makes it a national flash point. But other American cities have experienced equally devastating patterns of deindustrialization and state and federal neglect. In Michigan alone, six cities are under emergency management, and they are home to 49 percent of the state’s African-Americans. Michigan Congressman John Conyers has raised concerns about “a racial component of the application of this law” and warns that if bankruptcy proceedings gut union contracts and pensions, a serious blow will be dealt to what remains of the African-American middle class. He wants the House Judiciary Committee to hold hearings on municipal bankruptcies that target the pensions of retired public employees. That’s just one place where federal officials should intervene. Kildee’s effort to bring the Federal Reserve into the mix is wise, since the current Congress is disinclined to provide cities with the sort of bailouts Wall Street got. Under the right leadership, the Fed has the authority and the influence to focus federal attention on the urban crisis. Wiser still is Kildee’s recognition that the problems facing American cities are “much bigger than a failure of management.” There are complex lines of responsibility that run from Washington and the nation’s statehouses into city halls. To place all the blame on Detroit, as Governor Snyder has done in his rush to disempower local elected officials, is fiscal fantasy. The denial of democracy is even more serious, for Detroit and for America. Addressing financial problems by shutting voters out of the economic decisions that affect their lives and futures is not just profoundly undemocratic. It is also a deeply wrongheaded approach that blames the victims rather than changing the policies. David Zirin reports that although Detroit might be filing for bankruptcy, that isn’t keeping Michigan Governor Rick Snyder from pledging hundreds of millions of dollars to build the Red Wings a new stadium.